Adam Douglas Driver (born November 19, 1983) is an American actor. He rose to prominence in the supporting role of Adam Sackler in the HBO comedy-drama series Girls (2012–2017), for which he received three consecutive nominations for the Primetime Emmy Award for Outstanding Supporting Actor in a Comedy Series. He made his Broadway debut in Mrs. Warren's Profession in 2010. In 2011, he returned to Broadway in Man and Boy and made his feature film debut in J. Edgar. Driver has played supporting roles in a wide range of films, including Lincoln (2012), Frances Ha (2012), Inside Llewyn Davis (2013), and Silence (2016). He won the Volpi Cup for Best Actor at the Venice Film Festival for his performance in Hungry Hearts (2014); he also received several accolades for his lead performance in Jim Jarmusch's Paterson (2016). In 2018, Driver received Academy Award nomination for Best Supporting Actor and Golden Globe Award for Best Supporting Actor nominations for his performance in the film BlacKkKlansman. Adam Douglas Driver (born November 19, 1983) is an American actor. He rose to prominence in the supporting role of Adam Sackler in the HBO comedy-drama series Girls (2012–2017), for which he received three consecutive nominations for the Primetime Emmy Award for Outstanding Supporting Actor in a Comedy Series. He made his Broadway debut in Mrs. Warren's Profession in 2010. In 2011, he returned to Broadway in Man and Boy and made his feature film debut in J. Edgar. Driver has played supporting roles in a wide range of films, including Lincoln (2012), Frances Ha (2012), Inside Llewyn Davis (2013), and Silence (2016). He won the Volpi Cup for Best Actor at the Venice Film Festival for his performance in Hungry Hearts (2014); he also received several accolades for his lead performance in Jim Jarmusch's Paterson (2016). In 2018, Driver received Academy Award nomination for Best Supporting Actor and Golden Globe Award for Best Supporting Actor nominations for his performance in the film BlacKkKlansman. Driver gained wider recognition and acclaim for playing the main antagonist Kylo Ren in the Star Wars sequel trilogy, first in The Force Awakens (2015), followed by The Last Jedi (2017). He is set to reprise the role in Episode IX (2019). Driver is the Founder of Arts in the Armed Forces, a non-profit that brings high-quality arts programming to active-duty service members, veterans, military support staff and their families around the world free of charge. Driver was born in San Diego, California, the son of Nancy Wright (née Sneedham), a paralegal, and Joe Douglas Driver. His father's family is from Arkansas and his mother's family is from Indiana. His stepfather, Rodney G. Wright, is a minister at a Baptist church, and Driver was raised Baptist. He has English, Irish, Scottish, German, and Dutch ancestry. When Driver was seven years old, he moved with his older sister and mother to her hometown of Mishawaka, Indiana, and attended Mishawaka High School where he graduated in 2001. Driver had a religious upbringing and sang in the choir at church. As a teenager, Driver described himself as a "misfit," telling M Magazine that he climbed radio towers, set objects on fire, and co-founded a fight club with his friends after being inspired by the film Fight Club. After high school, and before his military service, Driver worked as a door-to-door salesman selling Kirby vacuum cleaners and as a telemarketer for a basement waterproofing company and Ben Franklin Construction. Shortly after the September 11 attacks, Driver joined the United States Marine Corps and was assigned to Weapons Company, 1st Battalion, 1st Marines as an 81mm mortar man. He served for two years and eight months with no deployments before breaking his sternum while mountain biking. He was medically discharged. After leaving the Marine Corps, Driver attended the University of Indianapolis for a year, then transferred to the Juilliard School to study drama. Driver said that he was seen as an intimidating and volatile figure by his classmates, and struggled to fit into a lifestyle so different from the Marines. He was a member of the Drama Division's Group 38 (2005–2009), along with his future wife Joanne Tucker. He graduated with a Bachelor of Fine Arts degree in 2009. In 2006, he and his wife Joanne Tucker started Arts in the Armed Forces. After graduating from Juilliard, Driver began his acting career in New York City, appearing in both Broadway and off-Broadway productions. Like many aspiring actors, he occasionally worked as a busboy and waiter. Driver also appeared in several television shows and short films. He made his feature film debut in Clint Eastwood's biographical drama J. Edgar in 2011. In 2012, Driver was cast in the HBO comedy-drama series Girls, as the emotionally unstable Adam Sackler, the boyfriend of the lead character Hannah Horvath (Lena Dunham). During the show's run he received three nominations for the Primetime Emmy Award for Outstanding Supporting Actor in a Comedy Series for his role. The same year, Driver played supporting roles in two critically acclaimed films, as telegraph and cipher officer Samuel Beckwith in Steven Spielberg's historical drama Lincoln, and Lev Shapiro in Noah Baumbach's comedy-drama Frances Ha. He also appeared in the drama Not Waving But Drowning and the romantic-comedy Gayby. Additionally, he garnered major off-Broadway recognition for playing Cliff, a working-class Welsh houseguest, in Look Back in Anger winning the Lucille Lortel Award for Outstanding Featured Actor in a Play. In 2013, Driver appeared in the drama Bluebird and the romantic-comedy What If. He played Al Cody, a musician, in the Coen Brothers' black comedy tragedy Inside Llewyn Davis, and photographer Rick Smolan in the drama Tracks. In 2014, he played Jude, a despairing father, in the drama Hungry Hearts, Jaime, an aspiring filmmaker, in Noah Baumbach's comedy While We're Young, and Philip, the black sheep of a dysfunctional Jewish family, in the comedy-drama This Is Where I Leave You. For his performance in Hungry Hearts, Driver won the Volpi Cup for Best Actor at the 71st Venice International Film Festival. In February 2014, Variety reported that Driver would play the villain, Kylo Ren, in J. J. Abrams' Star Wars: The Force Awakens (2015). On April 29, 2014, he was confirmed as a cast member. The Force Awakens was released on December 18, 2015 to commercial and critical success. Peter Bradshaw of The Guardian highlighted Driver's performance in his review of the film calling him "gorgeously cruel, spiteful and capricious... very suited to Kylo Ren's fastidious and amused contempt for his enemies' weakness and compassion." In 2016, Driver played a supporting role in Jeff Nichols' sci-fi thriller Midnight Special, which was released on March 18, 2016. He also co-starred in Martin Scorsese's historical drama Silence (2016) as Father Francisco Garupe, a 17th-century Portuguese Jesuit priest, alongside Andrew Garfield. In preparation for his role, Driver lost almost 50 pounds in weight. Jim Jarmusch's drama Paterson was Driver's final film of 2016, in which he played Paterson, a bus driver who writes poetry. The film premiered at Cannes Film Festival and was released on December 28, 2016. Driver's performance was acclaimed and he received multiple nominations for Best Actor from critics associations, winning several, including the Los Angeles Film Critics Association Award for Best Actor. Peter Travers of Rolling Stone wrote "Driver's indelibly moving portrayal is so lived-in and lyrical you hardly recognize it as acting." Paterson was included in many critics' top ten lists of best films of 2016. In 2017, Driver played a cameo in Noah Baumbach's The Meyerowitz Stories as Randy, marking his third appearance in one of Baumbach's films. The film premiered at Cannes Film Festival and was released on October 13, 2017 on Netflix. He also portrayed Clyde, a one-armed redneck veteran, in Steven Soderbergh's Logan Lucky, which was released on August 18, 2017. 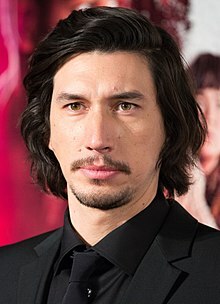 He reprised his role as Kylo Ren in Star Wars: The Last Jedi, which was released on December 15, 2017. His performance was positively received, with his character lauded as the best in the series: David Edelstein of Vulture wrote, "the core of The Last Jedi — of this whole trilogy, it seems — is Driver's Kylo Ren, who ranks with cinema's most fascinating human monsters." In 2018, Driver portrayed a Jewish police detective, Phillip "Flip" Zimmerman, who helps infiltrate the Ku Klux Klan, in Spike Lee's comedy-drama BlacKkKlansman. The film premiered at Cannes Film Festival and was theatrically released on August 10. He received critical acclaim for his performance in the film and was nominated for the Academy Award for Best Supporting Actor. Driver also starred as the lead character Toby Grisoni in Terry Gilliam's adventure-comedy The Man Who Killed Don Quixote, which also premiered at the same festival. Driver will co-star with Scarlett Johansson in the upcoming Untitled Noah Baumbach Project. He is set to star in The Report directed by Scott Z. Burns. He's also part of the ensemble cast of the upcoming Jim Jarmusch zombie comedy movie The Dead Don't Die. Driver is also attached to star in Sylvester Stallone's Tough As They Come, and Leos Carax's upcoming music drama Annette. He is expected to reprise his role as Kylo Ren in Star Wars: Episode IX. Driver married Joanne Tucker in June 2013. They live together in Brooklyn Heights, Brooklyn, New York, with their dog Moose, a Rottweiler-Pitbull mix. He is the founder of Arts in the Armed Forces (AITAF), a non-profit that performs theatre for all branches of the military, both in the United States and abroad. 2009 The Unusuals Will Slansky Episode: "The E.I.D." 2010 Law & Order Robby Vickery Episode: "Brilliant Disguise"
2012 Law & Order: Special Victims Unit Jason Roberts Episode: "Theatre Tricks"
2015 The Simpsons Adam Sackler (voice) Episode: "Every Man's Dream"
2016–2018 Saturday Night Live Himself (host) Episodes: "Adam Driver/Chris Stapleton", "Adam Driver/Kanye West"
2017 Bob's Burgers Art the Artist (voice) Episodes: "The Bleakening: Part 1 & 2"
↑ Brady, Tara (December 29, 2016). "Adam Driver, accidental superstar, on Star Wars, Scorsese and stepping up after 9/11". The Irish Times. Retrieved June 16, 2018. ↑ "Adam Driver Talks About His Most Favorite Birthday Gift Ever". W Magazine. November 19, 2017. Retrieved February 3, 2018. ↑ Feinberg, Scott (December 5, 2016). "'Awards Chatter' Podcast — Adam Driver ('Paterson' and 'Silence')". The Hollywood Reporter. ↑ "Adam Driver: 'Girls' Heartthrob Coming to a Theater or Magazine Cover Near You". Epoch Times. September 20, 2014. Retrieved December 1, 2015. ↑ Grigoriadis, Vanessa. "Adam Driver on Playing Lena Dunham's Boyfriend". Vulture. Retrieved January 22, 2014. ↑ Ransbottom, Virginia (December 28, 2007). "Exploring possibilities Mishawaka grad takes challenging path on course to Broadway". South Bend Tribune. Retrieved January 22, 2014. ↑ Harrell, Jeff (March 16, 2014). "A 'Star' turn for Mishawaka graduate Adam Driver | Inthebend". southbendtribune.com. Retrieved December 21, 2016. ↑ Kennedy, Mark (October 14, 2011). "In the driver's seat: Adam Driver's hot career". Reading Eagle. Retrieved January 20, 2014. ↑ Harrell, Jeff. ""The Force" of Adam Driver flies under the radar at Mishawaka High School". South Bend Tribune. Retrieved April 15, 2017. ↑ Stern, Marlow (May 15, 2013). "Adam Driver on 'Frances Ha,' His 'Girls' Audition, and Juilliard". Newsweek. Archived from the original on January 7, 2014. Retrieved January 22, 2014. 1 2 Takeda, Allison. "Adam Driver tells M Magazine About Starting A Fight Club, Juilliard". US Weekly. Retrieved September 19, 2016. ↑ "Famous Veteran: Adam Driver". Military.com. Retrieved July 4, 2014. ↑ Sicard, Sarah (December 15, 2015). "This Former Marine Infantryman Will Be The Villain In Star Wars Episode VII: The Force Awakens". Task & Purpose. ↑ "Adam Driver on what the military and acting have in common". www.npr.org. April 9, 2015. Retrieved January 4, 2016. ↑ "Adam Driver". The Juilliard School. Retrieved April 17, 2015. ↑ Ryzik, Melena (January 13, 2013). "And in this Corner, the Boys of 'Girls'". The New York Times. Retrieved January 14, 2013. ↑ "Adam Driver | Television Academy". Television Academy. Retrieved April 29, 2017. ↑ Van Meter, William (March 26, 2013). "ADAM DRIVER". Interview. ↑ "2012 Nominations and Recipients". Lucille Lortel Awards. Retrieved May 29, 2018. ↑ "Roy Andersson film scoops Venice Golden Lion award". BBC News. Retrieved September 7, 2014. ↑ Kroll, Justin (February 26, 2014). "'Star Wars': Adam Driver to Play the Villain (EXCLUSIVE)". Variety. Retrieved February 26, 2014. ↑ "Star Wars: Episode VII Cast Announced". StarWars.com. April 29, 2014. ↑ Breznican, Anthony (November 7, 2013). "'Star Wars: Episode VII': Release set for December 18, 2015". Entertainment Weekly. Retrieved November 7, 2013. ↑ Bradshaw, Peter (December 16, 2015). "Star Wars: The Force Awakens review – 'a spectacular homecoming'". The Guardian. Guardian News & Media Limited. Retrieved January 18, 2016. ↑ Sneider, Jeff (November 21, 2013). "Adam Driver Joins Joel Edgerton, Kirsten Dunst in WB's Sci-Fi Drama 'Midnight Special' (Exclusive)". TheWrap. Retrieved February 27, 2014. ↑ "Warner Bros Pushes Ben Affleck's 'Live By Night', Dates 'Midnight Special' & 3 Others". Deadline Hollywood. May 6, 2014. Retrieved May 7, 2014. ↑ Friedman, Roger (January 13, 2014). "Exclusive: Scorsese Adding Adam Driver to Next Film "Silence"". Showbiz411. Retrieved February 27, 2014. ↑ McNary, Dave (January 22, 2015). "Martin Scorsese Locks Funding for 'Silence'". Variety. Retrieved December 1, 2015. ↑ Sblendorio, Peter (November 30, 2016). "Adam Driver on losing 50 pounds for 'Silence' role: 'I don't think I've ever taken it to the extreme before'". New York Daily News. ↑ Jaafar, Ali (January 12, 2016). "Adam Driver To Star In Jim Jarmusch's 'Paterson', Amazon And K5 To Co-Finance". Deadline Hollywood. Retrieved April 30, 2017. ↑ Keslassy, Peter Debruge, Elsa (April 14, 2016). "Cannes 2016: Film Festival Unveils Official Selection Lineup". Variety. Retrieved April 30, 2017. ↑ Lang, Brent (July 25, 2016). "Adam Driver's 'Paterson' Gets Awards-Season Release Date (EXCLUSIVE)". Variety. Retrieved April 30, 2017. ↑ Zacharek, Stephanie (January 12, 2017). "Paterson Sings the Poetry of Everyday Life in the City". Time. Retrieved April 30, 2017. ↑ A. Dowd, A. (December 21, 2016). "Adam Driver mellows out in Jim Jarmusch's beautiful ode to ordinary living, Paterson". The A.V. Club. Retrieved June 13, 2018. ↑ Evans, Ross A. Lincoln, Greg (December 4, 2016). "Los Angeles Film Critics Name 'Moonlight' Best Picture Of The Year". Deadline Hollywood. Retrieved April 29, 2017. ↑ Travers, Peter (December 27, 2016). "'Paterson' Review: Jim Jarmusch Scores With Tribute to Poetry All Around Us". Rolling Stone. Retrieved June 13, 2018. ↑ "Film Critic Top 10 Lists - Best Movies of 2016 - Metacritic". Metacritic. Archived from the original on 2016-12-06. Retrieved June 12, 2018. ↑ Winfrey, Graham (April 13, 2017). "2017 Cannes Film Festival Announces Lineup: Todd Haynes, Sofia Coppola, 'Twin Peaks' and More". IndieWire. Retrieved April 13, 2017. ↑ Hayes, Dade (May 28, 2017). "'Logan Lucky' Trailer Reunites 'Magic Mike' Team–Plus Daniel Craig as Joe Bang". Deadline Hollywood. Retrieved June 13, 2018. ↑ Ruby, Jennifer (December 17, 2015). "Star Wars: The Force Awakens cast will all return for eighth film". Evening Standard. Retrieved April 30, 2017. ↑ Edelstein, David (December 12, 2017). "Star Wars: The Last Jedi Is Shockingly Good". Vulture. Retrieved May 14, 2018. ↑ Siegel, Tatiana; Gardner, Chris (May 14, 2018). "Cannes: Spike Lee's 'BlacKkKlansman' Draws 10-Minute Ovation". The Hollywood Reporter. Retrieved May 16, 2018. ↑ Keslassy, Elsa (April 19, 2018). "Cannes Adds Lars von Trier's 'The House That Jack Built,' Sets Terry Gilliam's 'Don Quixote' as Closer". Variety. Retrieved April 19, 2018. ↑ Kroll, Justin (November 17, 2017). "Noah Baumbach Casts Adam Driver, Scarlett Johansson, Laura Dern in Next Film". Variety. Retrieved November 18, 2017. ↑ McNary, Dave (April 4, 2018). "Annette Bening, Adam Driver, Jon Hamm in Talks for CIA Drama 'Torture Report'". Variety. Retrieved June 22, 2018. ↑ Fleming Jr., Mike (January 3, 2017). "Sylvester Stallone To Helm 'Tough As They Come,' Starring With Adam Driver". Deadline Hollywood. Retrieved April 30, 2017. ↑ Blistein, Jon (March 14, 2017). "Adam Driver to Star in New Music Drama 'Annette'". Rolling Stone. Retrieved April 30, 2017. ↑ Hutchinson, Corey (December 18, 2017). "Star Wars: Every Confirmed Cast Member For Episode 9". Screen Rant. Retrieved January 2, 2018. ↑ Takeda, Allison (June 24, 2013). "Girls' Adam Driver Marries Joanne Tucker!". Us Weekly. Retrieved June 27, 2017. ↑ Hawkes, Rebecca (November 30, 2016). "Adam Driver: 10 things you never knew". The Telegraph. Retrieved September 25, 2017. ↑ Mason, Wyatt. "Adam Driver Is A Force To Be Reckoned With", Esquire (magazine), November 20, 2017. Accessed January 6, 2019. "On a summery afternoon in late September, I arranged to meet Adam Driver near his home in Brooklyn Heights." ↑ "About Arts In The Armed Forces | AITAF: Arts In The Armed Forces". www.aitaf.org. Archived from the original on January 13, 2017. Retrieved March 8, 2017. ↑ Hall, Jacob (February 15, 2019). "'Star Wars: Episode 9' Has Wrapped Filming – See a New Image From the Set". /Film. Retrieved February 15, 2019. ↑ Trivedi, Sachin (June 27, 2018). "'Star Wars Resistance': Kylo Ren reportedly making cameo appearance". International Business Times. Retrieved August 31, 2018.